» The Strike Zone Time Travel Test: How Much of Baseball’s Anemic Offense Really Stems From the Swollen Zone? The Strike Zone Time Travel Test: How Much of Baseball’s Anemic Offense Really Stems From the Swollen Zone? New MLB commissioner Rob Manfred probably could have picked a better verb when he spoke earlier this week about “injecting additional offense in the game,” but the phrasing, evocative of Jose Canseco stories about bathroom stalls, was a useful reminder that we’re not far removed from the PED era, when baseball was awash in runs. What a difference a decade and a half makes: With scoring at its lowest full-season level since 1976 and contact hard to come by, the current referendum on run environment calls for more runs and, ideally, fewer strikeouts. In addition to trying to regulate lollygagging, baseball’s best minds are mulling how to help the sport’s ping-ponging stat lines settle into Goldilocks territory. Manfred’s mostly harmless mention of eliminating the shift touched off a chorus of “It’s the strike zone, stupid,”1 but while the shift’s impact remains murky, the mysteriously expanding strike zone’s toll is also foggy. Before we come to any conclusions about the way to fix a fairly healthy sport, we need to know where the problems really rest. Specifically, it would be helpful to know how much blame the zone bears for the game’s offensive slump relative to the rest of the usual suspects: PED testing, faster pitches, aggressive reliever usage, advance scouting, and hitters who don’t hesitate to swing away. How much has the new zone hurt hitters? And what would scoring have looked like last season with a less liberal zone? Let’s start with what we know. The zone is expanding, and it’s doing so in an easily discernible direction: downward. The following GIFs display alternating images from Hardball Times writer Jon Roegele’s most recent strike zone surveillance work. The first GIF shows the 2009 and 2014 strike zones called against left-handed hitters, from the plate umpire’s perspective; the second shows the zones called against righties. Mouse over each GIF to cycle between the two seasons. Compared to what they could expect six seasons ago — the year before a big drop in called-strike rate helped slash scoring and start a discussion about another “Year of the Pitcher” — today’s batters are dealing with a Stay Puft strike zone. The 2014 zone isn’t as wide as the old one was: Mercifully, the “lefty strike” — a called strike on a pitch so far off the plate that only Pablo Sandoval could drive it — has become less common. Unfortunately, the lefty strike’s relative scarcity hasn’t outweighed the other developments that have made hitters’ jobs harder. Pressured by MLB’s PITCHf/x-based Zone Evaluation system to enforce the rulebook’s definition of the strike zone, which extends to “the hollow beneath the [batter’s] kneecap,” umpires have awarded pitchers extra strikes below where they typically used to be called, without robbing them of any territory at the top. Roegele’s article says the average size of the 2014 zone was 475 square inches, up from 435 in 2009. That gain comes from the region less than 21 inches off the ground, where Roegele reports that pitchers have colonized an additional 47 square inches of strike zone. Those facts and figures tell us a lot about how the zone’s shape has evolved, but they also make it easy to overstate that growth. The boost from 435 to 475 square inches sounds like a 9 percent increase in zone size, which would be an enormous amount over a six-season span. In reality, though, the effect is more modest. The green boxes in the above GIFs are square-inch-size areas where caught pitches were called strikes more than 50 percent of the time; anything less than 50 percent shows up as empty. So while strikes weren’t a majority in any square-inch box lower than 21 inches — halfway between 1.5 feet and 2.0 feet on the y-axis — in 2009, some low strikes were always called: It’s not as if umps have switched from calling no strikes in those zones to calling only strikes. Moreover, the boxes don’t give any indication of sample size. Every box looks the same, but the ones at the center of the zone are much more tightly packed with pitches than the recently established outposts on the periphery. The best way to chart the effective size of the strike zone, if not its shape, is to look up the major league called-strike rate (called strikes divided by called pitches). This stat answers a simple question: On average, if a batter takes a pitch, how likely is it to be ruled a strike? For as long as we’ve been capable of calculating it, baseball’s called-strike rate has been on a gradual rise. The jump from 2013 to 2014 was only the 10th-biggest year-to-year increase since 1988, the first year for which we have pitch-by-pitch data. 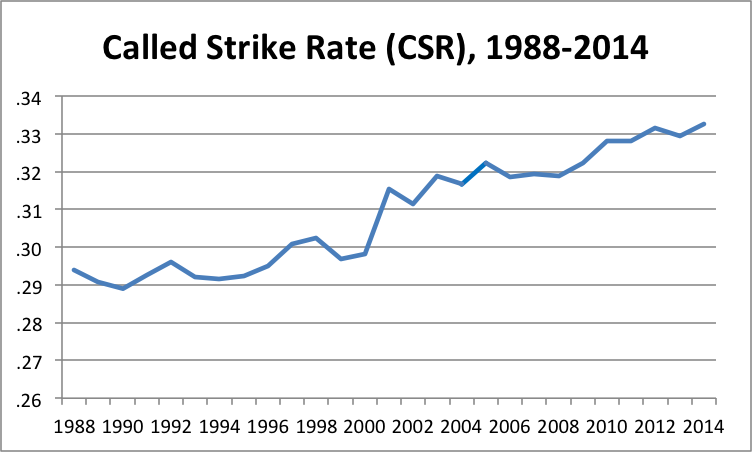 Most of the sudden CSR gains can be traced to events that were intended to tweak the strike zone. The biggest one-year gain, a 1.7 percentage point hike between 20002 and 2001, came from a bizarro version of the expansion we’ve seen lately, when MLB mandated that the top of the zone be observed more strictly. From 2002 to 2003, the CSR took its second-biggest leap, as QuesTec cameras were installed in additional ballparks, leaving umps with fewer places to deviate from the rulebook zone without being badgered by a computer. The third-biggest bump came in 1997, the first season of interleague play and the second following the most recent rulebook strike-zone expansion. And the fourth-biggest arrived in 2010, a product of PITCHf/x. Today’s CSR is almost 15 percent higher than it was in 1988, with nearly 90 percent of the climb occurring after 2000. Knowing how much the CSR has moved gives us part of the solution we’re seeking. We know what the CSR was last season, and we know what it was in 2009. Multiplying the difference between those two rates by the number of called pitches in 2014 (more than 300,000) gives us the number of strikes in 2014 that might have been balls had 2009’s more lenient CSR still been in effect: 3,094. Research has shown that the value of changing a single strike to a ball (and gifting the batter a more favorable count with a rosier expected outcome) is worth approximately 0.14 runs. Multiply those 3,094 alternate-history strikes by 0.14, and the calculator spits out 433 runs: the number that could have been scored last season, had the strike zone never expanded. Back in our harsh, low-offense reality, there were 2,658 fewer runs scored in 2014 than there were in 2009. If we could sprinkle those 433 fictional runs onto the actual 2014 total, they would erase 16.3 percent of that deficit. In other words, we can estimate that had the called-strike rate never climbed past its 2009 level, scoring would have been 16.3 percent higher last season, solely through those 3,094 strikes morphing back into balls. But that’s not where the current strike zone’s impact ends. A larger zone means more areas the hitter has to defend and fewer he can ignore, as well as fewer opportunities to feast on a pitch he can easily anticipate. The pitcher, meanwhile, has more leeway to explore the space, disrupting the batter’s timing by changing locations and eye levels with lower risk of throwing a ball. Although the hole that puts the hitter in is difficult to quantify, it’s not a negligible factor. The zone’s recent plunge compounds the problem for the batter. It’s not just that there are so many more pitches he has to be prepared to fight off; it’s that they’re all so low, and thus difficult to drive. The graph below plots Batting Average on Contact (BACON),3 Slugging Percentage on Contact (SLGCON), and CSR as a function of pitch height; the y-axis is normalized pitch height, where 0.0 is the vertical center of the zone. As you’d expect, BACON, SLGCON, and CSR are all at their highest in the center of the zone: When batters take pitches there, they’re usually strikes, and when they make contact, they hit the ball hard. The lower the pitch, though, the worse the results. That’s a problem for batters in the big strike zone era, because — as the yellow line with open markers shows — pitchers are forcing hitters to aim lower, which means settling for less production per plate appearance. Between 2009 and 2014, the called-strike rate on low pitches rose by more than 50 percent. As a result, hitters faced more pressure to swing at those pitches, and the percentage of balls in play that came on pitches at least one foot below center rose by roughly 18 percent. Although familiarity has helped batters mitigate the disadvantage of facing low pitches — their SLGCON on low balls in play has barely budged since 2009, while their SLGCON on all other balls in play has fallen by 26 points — they’re still much more productive against higher pitches. 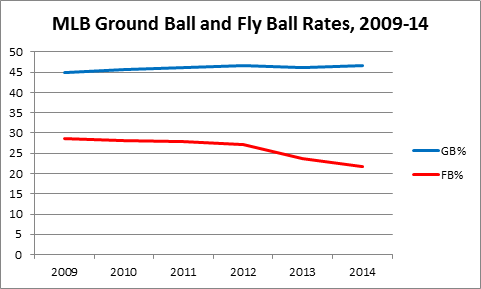 It’s no coincidence that ground ball rates have risen over the same span while fly ball rates have sunk. More grounders and fewer flies is a formula for fewer homers, and in turn fewer runs. Put all of those edges together — the called balls that become strikes, the increased element of surprise, and the lousy results on low pitches — and you have the Holy Grail: the impact of the swollen strike zone. To complete the picture, though, we’ll have to travel back in time. And here, the umps can help. On a leaguewide level, long-term trends look a lot less messy than they actually are. Drill down to the individuals, though, and there are leaders and laggards, players who seem to have stepped out of an earlier era or one still to come. The same is true of umpires. While the leaguewide zone has expanded, not every ump’s zone is as large as the composite plots in the GIFs above. Ninety umpires worked behind home plate last season, and each called a slightly different zone. We can determine the size of each of those zones with some help from Called Strikes Above Average, a new stat developed by Jonathan Judge, Dan Brooks, and Harry Pavlidis that will soon be available at Baseball Prospectus. CSAA enables us to evaluate how much influence any member of the batter-pitcher-umpire-catcher quartet has on the called-strike rate of any given matchup. In this case, we’re most interested in the ump. CSAA adjusts for a number of potentially confounding factors — including the pitch’s location and type, the count, the catcher’s receiving skills, and the pitcher’s command — in order to isolate the umpire’s impact. According to CSAA, 4.5 percentage points of called-strike probability separates the pitcher-friendliest ump from the one hitters should be happiest to see.4 In other words, given the same called pitch and the same batter/pitcher/catcher supporting cast, the odds of a strike call from the most generous ump would be 4.5 percentage points higher than the odds of seeing the same call from the stingiest, whose CSAA makes him roughly as likely to signal for a strike as an average umpire was in 2001. So here’s the final step: We’ll sort those 90 umpires by CSAA, with the most pitcher-friendly umps at the top of the list and the stingiest strike-callers at the bottom. Then we’ll start pruning big-strike-zone umps from the top until we have a group of 2014 umpires whose collective called-strike rate mirrors that of all umps from a year when the strike zone was smaller. And finally, we’ll see how hitters performed in 2014 with only that stingier subsection of umps behind the plate. Essentially, we’re looking for a high-scoring ember buried within a low-scoring season. If 2014 hitters mash like it’s 2009 again when we control for the umpires, then we’ll know that the expanded strike zone is the only thing holding today’s hitters back. If they hit no better than the rest of the league, we’ll know that the new zone isn’t responsible for baseball’s offensive doldrums. And if they hit somewhat better, but not all the way, we’ll be able to get a good sense of what portion of baseball’s slump the expanded strike zone has caused. I tried it first with 2010, plucking out pitcher-friendly umpires until the average CSR — though not necessarily the average zone shape, which could affect the results slightly — of the remaining umps, weighted by pitches called in 2014, matched the overall average from 2010. It took 27 cuts to get there, leaving 63 umpires. The table below shows a selection of offensive statistics from 2014 with all umpires included — last year’s league-average stat line — and, on the next row, with only the 63 post-purge umps included. The third row displays the league-average stat line from 2010, and the final row shows what percentage of the difference between the first and third rows the 2014 hitters made up by being matched with more conservative umpires. Removing pitcher-friendly umps until the more selective group’s CSR mirrored 2010’s brought back 27 percent of the missing scoring from that season, almost undoing the 0.13 drop in league-average ERA between 2013 and 2014. The strikeout rate didn’t bounce back to the same extent, but the batters’ triple-slash lines all rebounded by roughly 30 percent. I followed the same process for 2009, but because the called-strike rate increased considerably between 2009 and 2010, I had to remove many more umpires to lower the 2014 subset’s CSR to a similar level. In the end, only 19 of last season’s umps remained — still a sample of more than 37,000 plate appearances, or just more than one-fifth of the season. Again, I got similar numbers, with results suggesting that the larger strike zone has reduced the walk rate more than it’s raised the strikeout rate. These results suggest that the expanded strike zone has caused roughly 30 percent of the decrease in scoring we’ve seen over the last several years. 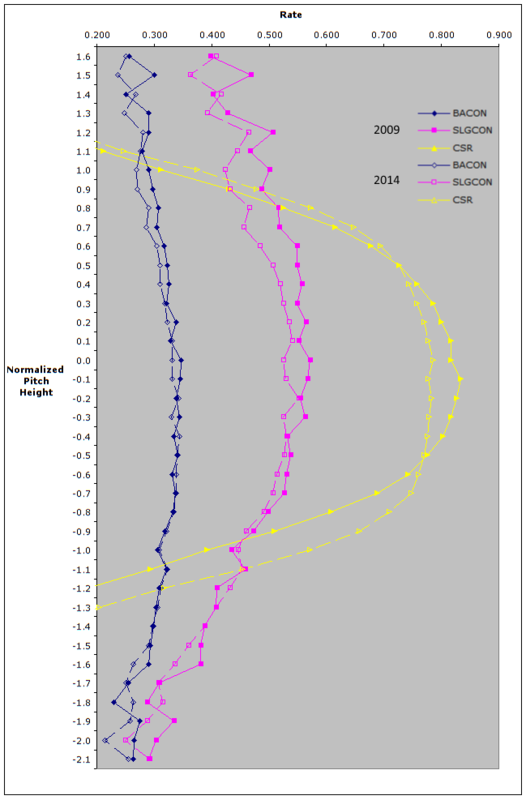 That jibes with previous figures derived using dissimilar methods: In 2013, Roegele estimated that the zone expansion had caused 31 percent of the scoring discrepancy between 2008 and 2013, while Brian Mills, studying the gap between 2007 and 2013, put it in the 24 percent to 41 percent range. That three independent estimates using different approaches arrived at answers in such close proximity strengthens my conviction that there’s more signal than noise in these estimates. The bad news is that we still haven’t explained where most of the missing runs went. If there’s a silver lining, though, it’s that it might not matter: Even if we could count and classify every lost run, those that currently remain unaccounted for would probably be tough to replace. If the culprit is PED testing, those runs are gone for good. If the problem is pitch speed, we could try lowering or moving the mound, but we’d risk placing additional stress on pitchers’ already fragile arms. And if reliever usage or batter approach is to blame, it would take time to curb baseball’s long-term trends toward shorter outings, bigger bullpens, and selective batters who take big hacks. Fortunately, we haven’t yet come to a crisis, and it’s possible that baseball’s cyclical, self-correcting nature will restore a more acceptable batter-pitcher balance before anyone has to step in. But if MLB does decide to take action, it should look to the strike zone first. There’s no need to try an untested approach: We know how much the new zone has hurt hitters, and we know the game works with fewer called strikes. In his 1988 Baseball Abstract, Bill James wrote that “An inch in the strike zone means far more than 10 yards in the outfield.” The zone is the fulcrum that can fix the sport; we’re just waiting for someone to apply the right push. Thanks to Dan Brooks, Harry Pavlidis, and Jon Roegele for research assistance. And not everyone was that polite. Another year in which the CSR rose, perhaps in response to the merging of AL and NL umpiring crews. The height of sabermetric humor. Although the strike zone looks much different today than it did several seasons ago, the names at the top and bottom of the umpire CSAA list look much like those that have appeared in similar spots on past rankings.